The company also hired a new chief financial officer. 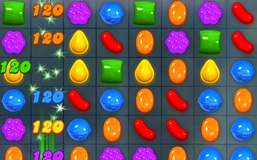 It seems Candy Crush Saga helped the developers at King sweeten their assets. The company reportedly filed paperwork in preparation for an initial public offering, or IPO, on the NASDAQ exchange, according to a report from Telegraph UK. If it's made official, the filing could be worth $5 billion. The Wall Street Journal previously reported that the British developer had spoken with the likes of JP Morgan, Credit Suisse and Bank of America in regards to the filing. Meanwhile, in other business news, King brought on Hope Cochran as chief financial officer, who previously worked as CFO for Clearwire. "We're thrilled that Hope is joining us," King CEO Riccardo Zacconi said to Venture Beat. "She has an exceptional track record of helping to manage fast-growing and entrepreneurial companies and as King continues to grow, we know she'll be a great addition to the team." We certainly wish King the best of luck with its business ventures.